New Delhi: Indoor air pollution caused 66,800 deaths of under-five children in India in 2016, 10% more than 60,900 deaths of under-five children caused by outdoor air pollution in the same year, according to a new study by the World Health Organization (WHO). In the age group of 5-14 years, indoor air pollution caused 4,700 deaths of children in India in 2016--the base year of the study--9% more than 4,300 deaths caused by outdoor air pollution in children of the same age group , according to the WHO study, released on October 29, 2018. These findings come at a time when north India is again gripped by polluted air as winter approaches. Air quality in the country’s capital Delhi plunged to the season’s worst levels on October 25, 2018, The Wire reported on October 25, 2018. The 24-hour average level of particulate matter (PM) 2.5--airborne particles 30 times finer than a human hair that can sicken or kill people by entering their lungs--was recorded at 168 microgram per cubic metre of air (µg/m3) in Delhi on October 25, 2018, about seven times the WHO prescribed 24-hour safe level of 25 µg/m3. PM 10--about seven times finer than human hair--was recorded at 369 µg/m3 in Delhi on October 25, 2018, about seven times the WHO’s 24-hour safe level of 50 µg/m3. Globally, indoor air pollution caused 3.8 million premature deaths in 2016--a toll greater than that due to malaria, tuberculosis and HIV/AIDS combined--including over 400,000 deaths of under-five children. In the same year, outdoor air pollution was responsible for about 4 million premature deaths; of these, almost 300,000 were children under five years of age, according to the study. “Breathing clean air at home is essential for children’s healthy development but widespread dependence on solid fuels and kerosene for cooking, heating and lighting results in far too many children living in terribly polluted home environments,” said the study. About 3 billion people worldwide still depend on polluting fuels and devices for cooking and heating, as per the WHO study. In India, nearly half of the household population use solid fuel for cooking. “Women and children spend most of their time around the hearth, exposed to smoke from cooking fires, resulting in indoor concentrations of some pollutants that are five or six times the levels in outdoor air,” the WHO study said. To assess the levels of air pollution, the study looked at the exposure of children globally to PM 2.5 and its effect on their health during various stages of their physical development. In 2016, children in India were exposed to an outdoor PM 2.5 level of 65 µg/m3. This is more than six times the WHO annual safe level of 10 µg/m3. In India, more than 98% under-five children lived in areas where PM 2.5 exceeded the WHO standard in 2016. About 93% children and about 630 million under-five children in the world were exposed to levels of PM 2.5 higher than the WHO prescribed safe level of 10 µg/m3. Children are vulnerable and susceptible to air pollution, especially during fetal development and in their earliest years, according to the study. “Their lungs, organs and brains are still maturing. They breathe faster than adults, taking in more air and, with it, more pollutants," said the report. “Their bodies, and especially their lungs, are rapidly developing and therefore more vulnerable to inflammation and other damage caused by pollutants,” it said. Acute respiratory infections caused by air pollution are the second biggest cause of death in under-five children globally, after premature birth--the leading cause--as per the study. 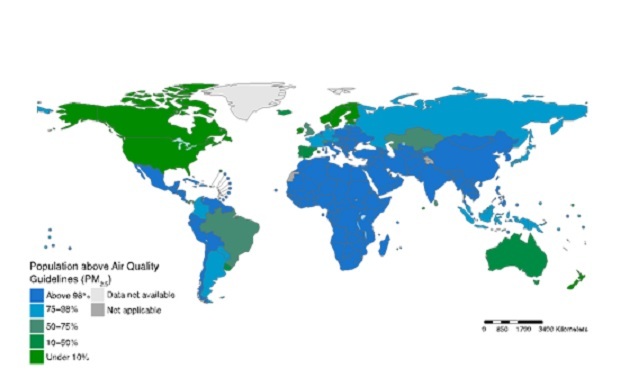 Adverse birth outcomes: Numerous studies have shown a significant association between maternal exposure to air pollution and adverse birth outcomes such as low birth weight, preterm birth and infants born small for gestational age. "In India, infants born to women who used biomass fuels such as wood and/or dung as the primary cooking fuel in the home during pregnancy were more likely to be small for gestational age," said the study. Infant mortality: There is compelling evidence of an association between air pollution and infant mortality. As pollution levels increase, so too does the risk of infant mortality, particularly due to exposure to particulate matter and toxic gases. Neuro-development: Prenatal and postnatal exposure to air pollution can negatively influence neuro-development, lead to lower cognitive test outcomes and influence the development of behavioural disorders such as autism spectrum disorders and attention deficit hyperactivity disorder. Lung function: There is robust evidence that exposure to air pollution damages children’s lung function and impedes their lung function growth even at lower levels of exposure. Studies have found compelling evidence that prenatal exposure to air pollution is associated with impairment of lung development and lung function in childhood. Conversely, there is evidence that children experience better lung function growth in areas in which outdoor air quality has improved. Acute lower respiratory infection, including pneumonia: Numerous studies offer compelling evidence that exposure to outdoor air pollution and indoor air pollution increases the risk of acute lower respiratory infections in children. There is robust evidence that exposure to air pollutants such as PM 2.5, nitrogen dioxide and ozone is associated with pneumonia and other respiratory infections in young children. Asthma: There is substantial evidence that exposure to outdoor air pollution increases the risk of children developing asthma and breathing pollutants exacerbates childhood asthma. While there are fewer studies on indoor air pollution, there is suggestive evidence that exposure to indoor air pollution from use of polluting household fuels and technologies is associated with the development and exacerbation of asthma in children.